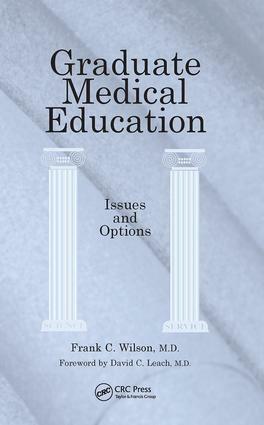 This book explores and offers solutions to critical issues in graduate medical education, including how students are taught and evaluated and how their educational programs are funded. It will be key reading for medical educators, policy makers and all individuals and organizations with an interest in medical education. Graduate Medical Education: Then and Now. Credentialing in Medicine: Protecting the Public. Teaching and Learning: Establishing an Educational Continuum. The Evaluation of Residents: Assessing Competent Performance. Work Hours and the Supervision of Residents. Science and Service: The Pillars of Professionalism. No Tempests, No Teapots: Fostering Research in Medical Education. Psychomotor Education: Point and Counterpoint. Teaching by Residents: Passing it on. Mentoring Young Physicians: The Need for Nurture. Funding Graduate Medical Education: Who Will Pay? Manpower: Supply and Distribution. Obligations of Residents: With Rights Come Responsibilities. Recommendations: What Then Must We Do? Afterword. Appendix. Index.